Century Pools offers the latest in Portable Spas, Spill-Over Spas for your inground pool and Traditional Free Standing Spas. Our manufactures are, Garden Leisure Spa Series, Durasport Spas, Strong Spasand Pacific Pools. For more information on the models of Spas available to you, feel free visit our spa manufacturers’ websites: Garden Leisure Spa Series, Durasport Spas, Strong Spasand Pacific Pools. 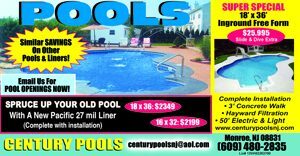 For questions about our selection of Spas please contact Century Pools at 609-259-6169 or fill out our Contact Form on the left side of the page. You can also visit us at our new Showroom Location, click here for directions.